A group of 11 students from Monash University recently experienced the lifestyle of the Orang Asli in the state of Perak. Kampung Chang Lama, a Semai community located near Bidor (Perak) played host to the students. Organised by Dr Yeoh Seng Guan, Course Coordinator of the Communication Program from the School of Arts and Sciences with the assistance of Ms Puah Sze Ning, a final year Communications student, the trip was a follow-up to a Photo and Orang Asli Handicraft exhibition organised a couple of months earlier. The Monashians were joined by a few Mah Meris from Pulau Carey. 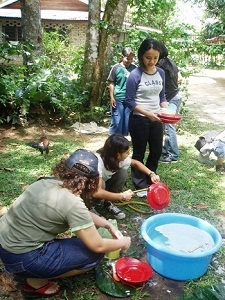 Dr Yeoh said that the primary aim of the trip was to expose the students to the culture and concerns of the Orang Asli. “The students showed a high level of enthusiasm throughout, although most of them have not experienced the lifestyle in a rural environment prior to this trip,” he said. Students were given an insight into how, for the Orang Asli, their cultural and economic survival is closely linked to the natural environment. Ms Puah further mentioned that the trip enabled the participants to learn the importance of respecting the belief of others. “We had a very pleasant trip and were overwhelmed by our host’s friendship and hospitality. 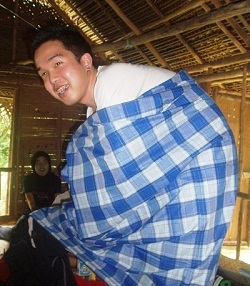 We were pampered with different types of food and mastered the art of using the sarong,” added Ms Puah. Ms Katrin Schmidt, 23, a second year Science student said that she had a wonderful experience discovering the culture of the indigenous people. “The Orang Asli strongly believe that people who abuse the forest and its wildlife will be subjected to retribution and punishment. Moreover, they are contented with what they have and do not take more than what they need,” said Ms Schmidt. Ms Farhah Isyqi, 24, a second year Communication student, said that the trip was educational in terms of getting to know the problems of the Orang Asli community firsthand. “They are very hardworking, approachable and friendly people. I was amazed to find out that they wake up as early as 4am in the morning to carry out their chores. The younger generation is actively involved in spreading awareness on the importance of education among children,” said Ms Isyqi.